CA Southern Africa announced that CA Technologies revealed the results of an extensive global survey of consumers, cybersecurity professionals and business executives about their views on digital trust. Conducted by analyst firm Frost & Sullivan, the inaugural report, titled ‘Global State of Digital Trust Survey and Index 2018,’ highlights how consumers perceive and trust organisations to protect their digital data. It also includes significant data about how business leaders and cybersecurity professionals at organisations view their responsibilities of data stewardship, the licensing of consumer data to third-parties and the technologies they are implementing to protect data and customer privacy. This report comes at a critical time, as consumers are increasingly transacting online – whether for work, leisure or play – providing organisations with access to vast amounts of data, from consumer profiles and personal information to user behaviour and habits. With that increasing store of data also comes greater responsibility to protect it against abuse from external and internal sources. Amidst a continuous stream of headlines about major data breaches in enterprise and government agencies, the degree to which consumers have placed their trust in organisations to protect their personally identifiable information (PII) online has never been more relevant. In 2017 alone, the number of confirmed data breaches globally was staggering. Against this backdrop, it is crucial for business leaders to understand worldwide public sentiment concerning the sharing of information online, and the impact of data and privacy breaches on the company’s bottom line. Responses to the survey showed that the Digital Trust Index for 2018 is 61 points out of 100, a score that indicates flagging faith from the consumers surveyed as it pertains to the ability or desire of organisations to fully protect user data. The index was calculated based on a number of different metrics that measure key factors around the concept of digital trust, including how willing consumers are to share personal data with organisations and how well they think organisations protect that data. • Nearly half (48%) of consumers report that they currently use, or have used in the past, services of organisations that were involved in a publicly disclosed data breach and, of those, 48 percent have stopped using the services of an organisation because of a breach. • There is a 14-point gap between the Digital Trust Index of consumers (61%) and the perceptions by business decision-makers and cybersecurity professionals (75%), signifying mismatched perceptions among these audiences in a measurement of perceived consumer trust versus actual consumer trust. • Only half of consumers surveyed (49%) are willing to provide their personal data in exchange for digital services. • 90% of organisations claim that they are very good at protecting consumer data, showing a high level of self-confidence, despite the fact that nearly half (48%) of business executives admitted that their organisation has been involved in a publicly disclosed consumer data breach in the last year. • 43% of business executives admit to selling consumer data that includes personally identifiable information, while only 15% of cybersecurity professionals surveyed knew that their company was selling data containing PII. These results point to a significant gap between how organisations view their responsibilities on data stewardship and consumer expectations around how organisations protect consumer data. In the application economy where data is king, organisations must prioritise data privacy and security or risk serious ramifications. Organisations can mitigate these risks by taking a proactive stance on security, such as narrowing their policies for sharing user data, reducing privileged user access, implementing continuous user authentication technologies, and adopting better cybersecurity and privacy controls to stop hackers. The global online survey of 990 consumers, 336 security professionals and 324 business executives across 10 countries was sponsored by CA Technologies and conducted by Frost & Sullivan in March and April 2018. The survey’s respondents assume senior business and IT positions at public and private enterprises across nine industry sectors. 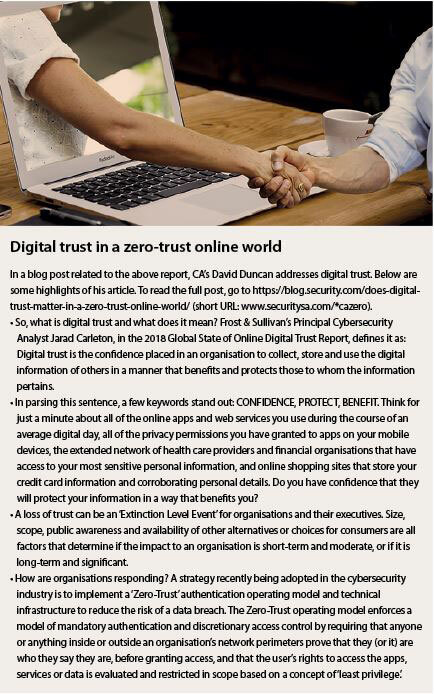 Download the full report at https://www.ca.com/content/dam/ca/us/files/white-paper/the-global-state-of-online-digital-trust.pdf (short URL: www.securitysa.com/*CAreport). Download the infographic at https://www.ca.com/content/dam/ca/us/files/infographic/the-true-state-of-digital-trust.pdf (short URL: www.securitysa.com/*CAinfog).